Features: High Brightness, Mini, Dollhouse Decor. Make your dollhouse more attractive. Type: Dollhouse Light. 1 x Dollhouse Light. Applicable for 1/12 miniature dollhouses. Due to the light and screen setting difference, the item's color may be slightly different from the pictures. 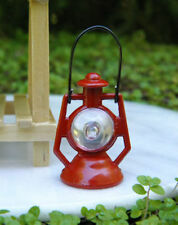 1:12 Dollhouse Accessories Miniature Light Desk Table LED Light Lamp. -1:12 scale beautifully designed table lamp model dollhouse miniature LED light. - Place it on the desk or bedside in your doll house for more realistic detail. Specification: 3 Volt, the LED bulb can‘t be replaced, The suitable battery model is Lithium cell CR927. 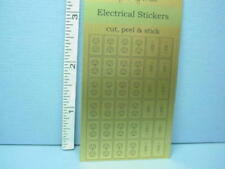 Great for adding life atmosphere for your dollhouse. Material: Iron. Detail Image. The color may have different as the difference display,pls understand. Color: As shown. We will try our best to reduce the risk of the custom duties. 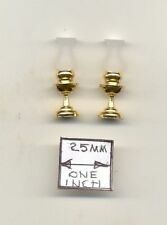 Dollhouse Miniature Estate Vintage Lot Brass Lighting . Condition is Used. Shipped with USPS First Class Package. I’m sorting and listing bags of accessories so if I find more electrical, I will add to this lot but I think I got most with former listed lot! Lighting lot, most new! Floor lamp, 7 chandeliers, electrical lights, ceiling lights, Tiffany style stained glass (plastic), shades, electrical wiring, ceiling lights, and much more including a transformer! I’m starting this low to give everyone a chance. No offers below beginning amount please. LISTING ACCESSORIES ALL DAY TODAY! Materials: Metal,PC Dimension approx. 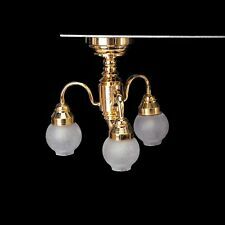 : Height 50 mm (1.96") Power: 3 Volt Battery: Lithitum Cell CR927 (Included) Bulb can't be replaced Switch on the base of the lamp Color: Copper plating Applicable to 1:12 Dollhouse or Blythe scene Package Included: 1 x Miniature desk lamp with 5pc electronic candles (other item NOT included) Tips: We would open the packing to test the lamp before shipping. Warning: Not edible, keep it away from infants. Note: Please note this item is not full size, it / they are for a dolls house and miniature collectors. 1 x Dollhouse Chandelier. It will makes the doll house retro and delicate with this new furniture. Features: Realistic, Mini Size, Gift, Can Not Light, Retro. So it would be easier to install in your doll house without any wire attached. Applicable for: 1/12 Miniature Dollhouse. 5 CANDLES TABLE LAMP LED. Because the battery is contraband goods transported by air, we can't send the battery to you, if you buy the light, you need buy batteries in the local. From Miniature House's collection of detailed dollhouse miniatures. in to 1ft. 1:12 Scale. This is sized for a dollhouse. Would greatly enhance your outdoor miniature scene. 12'' VINTAGE crystal lamp . Materials: Metal,PC Dimension approx. 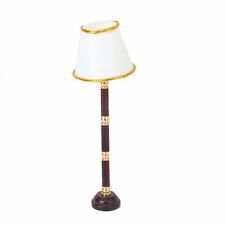 : Height 105 mm (4.13") Battery Specification: Lithitum Cell CR927,3V Bulb can't be replaced Switch on the base of the lamp Lamp base can be removed by anticlockwise unscrew and install battery Applicable to 1:12 Dollhouse or Blythe scene Package Included: 1 x Miniature floor lamp (other item NOT included) Tips: We would open the packing to test the lamp before shipping. Warning: Not edible, keep it away from infants. Note: Please note this item is not full size, it / they are for a dolls house and miniature collectors. This 12v working hurricane lamp with long chimney makes a wonderful addition to your miniature scene. 1:12 Scale. This is sized for a dollhouse. Features a replaceable bulb and includes the plug. It will work in all Lundby dollhouses made from 2000 on. It is 3.25” high, made of white plastic with a pink shade. From Aztec Imports Town Square Miniatures collection of detailed dollhouse miniatures. This Chandelier will make a nice addition to your miniature scene. 1in to 1ft. 1:12 Scale. This is sized for a dollhouse. This 5 arm chandelier is modeled after the French Victorian brass chandeliers. It features ornate chains with a cobalt blue centre bowl. Bulb is replaceable. It's even more beautiful in person! Size: 3" long (excluding the chain) 2 1/2" wide. 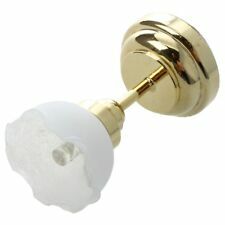 DOLLHOUSE MINIATURE WALL LAMP. Applicable for: 1/12 Miniature Dollhouse. Specification: 3 Volt, the LED bulb can‘t be replaced, the model of the battery is lithium cell CR927 3V. Because the battery is contraband goods transported by air, we can't send the battery to you, if you buy the light, you need buy batteries in the local. Miniature Brass Genie Lamp Mini Ornate Alladin Vintage 4"
1:12 DOLLHOUSE MINIATURES CEILING LAMP. Applicable for: 1/12 Miniature Dollhouse. Because the battery is contraband goods transported by air, we can't send the battery to you, if you buy the light, you need buy batteries in the local. Condition is Used. T hi s is t he n ic es t mi ni at ur e Hu rr ic an e La mp I’ve ev er s ee n. It’s ve ry w el l ma de o f br as s an d gl as s. T he d et ai l wo rk i s no te wo rt hy. 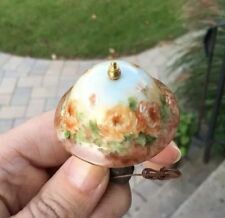 THIS IS A DOLLHOUSE "ELECTRIC HANGING LIGHT FIXTURE" DONE IN THE TIFFANY STYLE. IT IS PLASTIC HOWEVER SO AS NOT TO DISAPPOINT YOU. IT CAN BE USED ELECTRIC OR NON ELECTRIC AS WELL. Sticker on bottom reads "Made in Hong Kong". Item # 3P-28. 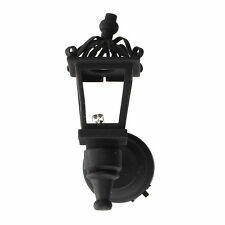 Perfect wall light for your dollhouse. Base is a pewter color. 12v Electric. Wall adhesive pad. looking for, send us a note. We may have it! Item #1003 (CK-1003). Dollhouse Miniature. Cir-Kit Concepts Dollhouse Wall Outlets (Double). From Cir-Kit Concepts collection of detailed dollhouse miniatures. This will make a nice addition to your miniature scene. 1in to 1ft. 1:12 Scale. This is sized for a dollhouse. 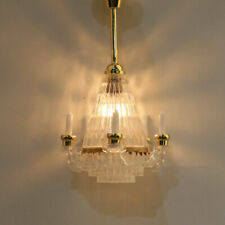 This three light chandelier has CK1010-29 replaceable bulbs. The No. 66 wire-size bit is used principally in the CK104 kit for making the proper size hold for "fixture" and "circuit" type wires. Detailed scale model for adult collectors. Not intended for children under 14. An excellent addition to your dollhouse, lighthouse, boathouse, or scene. Imagine this floor lamp with the matching table lamp T8672. 12V; working. Bulb can be replaced; plug is included. Plug up to 3 light fixtures into each outlet. You will receive 2 outlets as shown in photo. This cascading crystal chandelier is featured with many crystal tubes and teardrop crystals. It took hours to make. Bulb is replaceable. It's even more beautiful in person! Applicable for: 1/12 Miniature Dollhouse. Specification: 3 Volt, the bulb can't be replaced, the size of the battery is Lithitum Cell CR927, Switch on the bottom of the lamp holder. ELEGANT FLOOR LED LAMP. From Houseworks collection of detailed dollhouse miniatures. This will make a nice addition to your miniature scene. 1in to 1ft. 1:12 Scale. This is sized for a dollhouse. LED bulbs are nonreplaceable, but can burn up to 4000 hours.